These pruners from the Wilkinson Sword brand, are a very popular choice for many UK buyers. They are a set of by pass pruners, made from aluminium, and are rated very highly by those who have bought, and used them. As you can see from the image below, they certainly look the part. 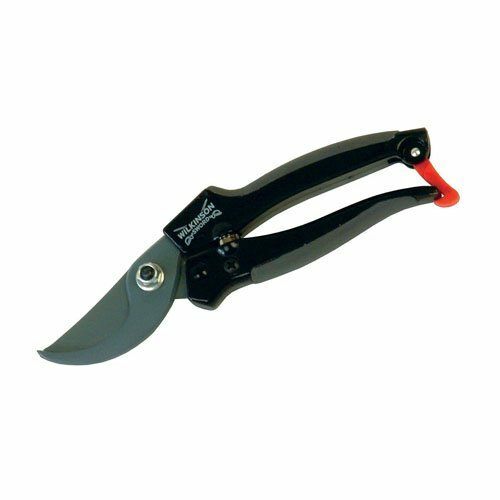 This pruner certainly ticks all of the important features, that bypass pruners should have. The blades are non-stick, they can be used by either left or right handed people, and they have nice soft grips. That makes them comfortable to hold and also when squeezing to make the cut. They can cut up to 20 mm.​ Buyers really like these a lot and these have sold a lot. Overall buyers rate these as 4.8 out of 5 stars, which is of course an excellent rating. I have broken those down below so as you can see, just how highly rated they are. As you can see the huge majority of real life buyers rate these as a 5 star product. When I checked the couple of complaints about these, one of them actually said the product was very good. Clearly they filled out the star rating incorrectly. The other poor review said that the spring broke. That appears to have been an isolated incident. You can see from the above information, that these are clearly a very high quality product. They cost under ​£14. In my opinion that also makes them very good value for money. We know how highly they rated these pruners. Now let's pick up on the main comments, and see what they actually used them for. Just before we do that, it is worth pointing out a couple of useful features, that these pruners have. ​They feel nice in the hand, are well balanced and they are indeed comfortable to hold. They are also sharp, sturdy and very well made. If you have used secateurs before, you will know that one truly annoying problem, is the blades sticking. That does not happen with these, so sticking and jamming is never going to be an issue. These are a true delight, even more so considering the very reasonable price. Good, strong secateurs. Used on branches up to 2 cm thick without much problem. These are at an affordable price, and we think that makes them very good value for money. They are also very sharp so will easily cut through up to 20 mm, without sticking. That makes them ideal for general pruning.